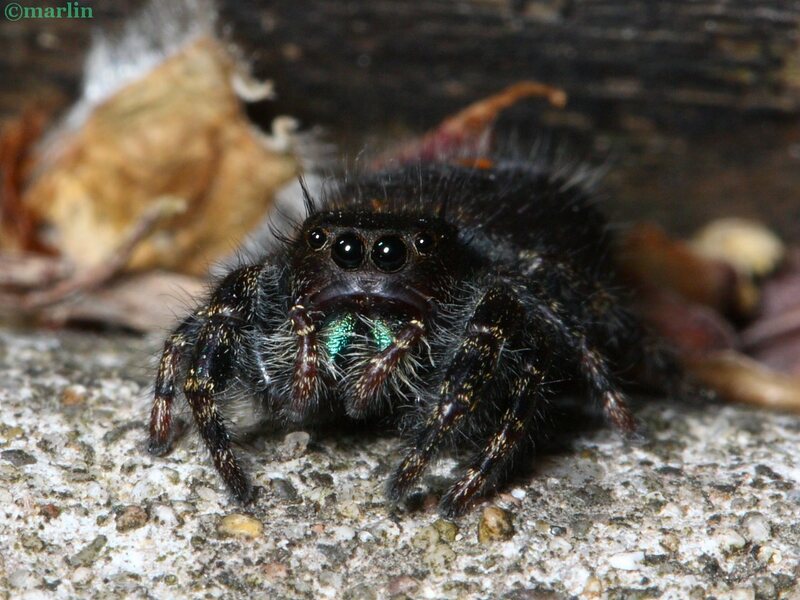 The bold jumping spider is one of the largest and certainly one of the most frequently encountered of the Salticids. Their active lifestyle, conspicuous dark-colored body, and frequenting of the flower or vegetable garden environment brings them to the attention of casual observers and gardeners of all stripes, many of them dedicated arachnophobes whose first reaction is to kill the unfortunate beast. Spiders of all varieties are of great benefit to the gardener, helping to keep down the burgeoning population of insects that are doing real damage to the plants. They eat bugs and flies and just about any small soft-bodied insect that blunders within range of its highly accurate, leaping capture and venomous fangs, which are used to quickly immobilize the prey so it may be devoured without struggle. You can see this spider is trailing two silken draglines, one from each spinneret. The spinnerets can point in different directions. Unfortunately, most people (myself included) have a deep aversion to spiders, especially big, black, hairy spiders – of which the bold jumper certainly is a fine example. And there’s a reason for their common name: they will often stare you down. At least that’s the impression we get when such a scary critter turns and faces us. However, she just thinks you’re a predator; spiders don’t live long who ignore large, moving animals in their vicinity. If you look closely and have good eyesight, you might also see her threat display – she’ll wave her pedipalps rapidly in front of the iridescent green chelicerae, creating a surprisingly effective flashing warning signal. Technically, P. audax is a black spider with three white spots on its abdomen, as above. However, coloring is notoriously variable, and this species hybridizes with P. regius and P. otiosus, creating yet another complex of hybrids to further confuse identification, especially from photographs. Our apparent inability to view the natural behavior of spiders without anthropomorphizing into them malicious intent has lead to this spider’s stigmatization in popular culture as an aggressive, bite-soon-as-look-at-you churl of the rose garden. Instead, the opposite is true. These spiders always choose escape if they have a choice. You’d have to work pretty hard to be bitten. Salticids, with rare exceptions, do not build webs to snare prey, they only spin small silken retreat webs for moulting or resting. When hunting, jumpers always trail silken strands from their spinnerets. If they are disturbed, they will jump or fall on this lifeline to the ground and out of sight. These little guys are very adept at hiding, and if they do not want you to see them, you won’t. Jumping spiders have excellent vision, among the highest acuity in invertebrates. The eight eyes are grouped four on the face (the two big anterior median eyes in the middle, and two smaller anterior lateral eyes to the side), and four on top of the carapace. The two large, forward-facing eyes (AME) are tubular behind the lens, with a well-developed musculature, unique to salticids, that supports and moves the retina – the opposite arrangement of our own eyes.